With Zankyou, you can get your wedding registry and customise it to your liking by choosing the price of every gift. Surprise your guests with unique details, and make them a part of your honeymoon. Integrate the registry onto your website, and share it with your family and friends - including a free card in your invitations! They will undoubtedly love the chance to give you the best gift possible for your wedding. Transfer the money directly to your PayPal account, and use it with complete freedom. Add your registry to your wedding website free of charge, and share all the details of the big day so that nothing is missed: wedding calendar, geolocalised maps, RSVPs, hotels, transport, photographs, videos... a unique and private space that you can design and tailor to your liking, which allows your guests to interact from anywhere in the world. Do you want a unique wedding website? Purchase a custom domain, create cards (free of charge, with the name of your website) to include in your invitations, and manage privacy settings with ease - amongst many other things! Add the coolest gift ideas to your registry and receive the cash equivalent in your account. Add it to your registry! With Zankyou you receive all guests' contributions in cash, and you can then transfer the money directly to your PayPal account to spend it on whatever you want. You can send thank-yous directly from your mobile, and also download a breakdown of the payments from your registry. Discover the easiest, most elegant way of receiving gifts from your guests! 100% cash: Each gift has a service cost of 2.95% + 99¢ per gift paid. Download the free Zankyou APP, and have complete control over all of the payments you receive, and thank your guests directly. Using a wedding registry has never been easier! Why is Zankyou safe to make the payments? Zankyou guarantees the total safety of your money. The funds are always in your name and transferred immediately to your PayPal account. Besides, the platform complies with all security standards mandated by European electronic trade regulations. How can I add gifts to my wedding list? Customizing your wedding list on Zankyou is very simple! We offer you a wide catalog of gift ideas sorted by brands and categories. Once the gifts are on your list, you can change them at will! You can also create your own gift ideas with a simple form where you just enter a price, a description and a picture. You can even add the steps of your honeymoon, which will then be shown on a map for a rendering always more playful for your guests! Why is it useful for my guests? 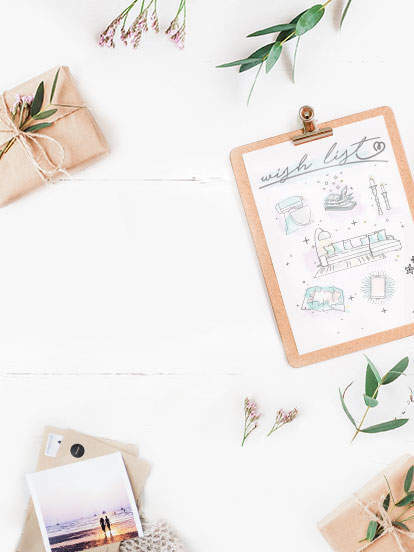 You will find everything you need to know about your wedding: how to get to the venue with maps, nearby hotels you can book, replies from RSVPs, and contributions to gifts, amongst a whole host of other things. Share all the information for your wedding in one click! Why choose Zankyou instead of sending my bank account to my guests? The online wedding registry allows you to directly receive your guests' contributions in cash, in a much more personal way. Alongside the money, you will receive a personalised congratulations message, and we know that your guests will love to feel that they are giving you something you will like. Spend the money from your registry however you like. Some money towards your honeymoon ? "Simple, user-friendly and with amazing features!" "Zankyou is a genius idea with great features"